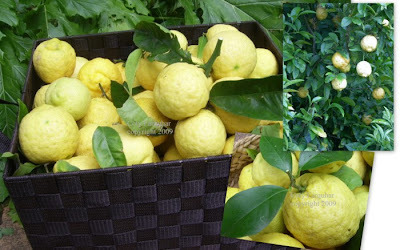 My girlfriend Christine dropped in to visit us recently for a quick coffee and arrived at the front door with a huge basket of lemons. This is what is so special about living in the country and why I love living here. I often arrive home and find a little bunch of flowers or herbs, a bag of fruit or something sweet ,,, just baked on my front door mat. One day one of our builder friends dropped off a trailer load of beautiful plants that had been dug out of a large garden near by. He just thought we might like them. These gifts don't come from shops, they don't cost anything, they're just a lovely gifts from friends, and they mean so much to me. Christine's tree was dripping with huge lemons, I couldn't resist taking this photograph of her lemons (yes, I know there is a joke there) and running up to her garden to photograph her tree. What kind friends you have! I miss that. It was that way where I grew up, but those nice people have been dead for awhile now. Yes, these are the best gifts to get Coty! I'm very jealous of the lemons, as with the drought down here the quality of the lemons at the moment is dismal. We've had 1mm. of rain since Christmas, hardly worth recording really.